Gekza Security Solutions started training program for Students who wants to learn latest technologies. GSS Founder Khaleel Ahmed Khan address to several IT students in Hyderabad about #GekzaPy. this training module developed to help students about Python Programming. Python is the programming language which is the most preferred option for having high-performance computing. It is the most simple and easiest programming language with straightforward syntax. Who should prefer this course? Those candidates who want to lead their life in this file can prefer this course. Job aspirants, graduates, Freshers, software professionals, IT candidates, system analysts can prefer this course. It really helps you a lot by taking this course. In today's world, as it is the leading technology, it is better to prefer this course. Python training is provided in the unique way. The complete guidelines are also provided to the candidates in the Live Project. 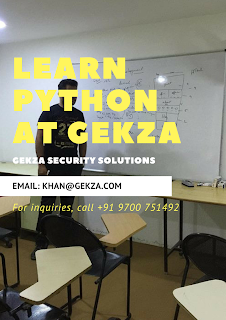 At the end of the course we also provide certification on this Python in which it will change your entire career graph.